In several previous posts, the Trojan Heron has covered CAPR's lawsuit about the Open Public Meetings Act (OPMA). This lawsuit has to do with the alleged secret meetings of the former CAO Implementation Committee, which was comprised of County staff (including a Deputy Prosecutor) and three former Council people. The committee was formed to help shuffle the CAOs along, which are the subject of a separate lawsuit involving the County, the Friends, and the Common Sense Alliance. Regarding the OPMA and the CAPR lawsuit ... the closed meetings of the CAO Implementation Committee took place regularly for months. CAPR's position is that these meetings should have been open to the public, according to the OPMA, because the committee took action on behalf of the Council in reviewing and discarding CAO options ... and because the committee involved a negative quorum of Council members (three members being sufficient to vote down a proposal). The County alleges that no actions were taken in these meetings ... nothing happened. There were hundreds of hours of meetings, and nothing substantive occurred. They invited in consultants and staff, but only discussed ministerial functions such as scheduling. There are no meeting minutes, only some hand scribbled notes in addition to emails between staff and committee members. When deposed about the content of the meetings, participants could not recall what they discussed. Despite all this "nothing" going on, in a January 2013 Council meeting, the Council spent time in one of their non-secret meetings congratulating themselves on the work they got done in committees and subcommittees. Councilman Stephens even referred to the CAOs directly. Pratt said that she could hardly remember any Council votes where subcommittees didn't get their way. Yesterday, this case finally reached the Washington Supreme Court. Oral arguments were heard. A ruling is still several weeks away. The justices were very engaged and asked good questions yesterday. Several seemed skeptical that the County could spend so much time in secret doing nothing. The downfall of Oregon's four-term governor should be a cautionary tale to our Washington politicians, whether they hold office in Olympia or in our local rotten boroughs. It's quite the story, and the Washington Free Beacon has a good summary of the money and political relationships at work in Kitzhaber's downfall. If you read the linked article, imagine the howling there would be if you were to substitute "Koch" for "Steyer" in the report. In June 2014, Shift exposed a series of emails that reveal how Jay Inslee’s green agenda is heavily influenced by outside extreme environmental organizations and paid-for political consultants. In fact, Shift discovered that the very environmental organizations caught in the Kitzhaber scandal—the Tom Steyer-fund Energy Foundation and Rockefeller Brothers Fund—are at work in Inslee’s administration. Despite the scandal that unfolded in Oregon and the newfound relevance of Shift’s investigation, most media outlets in Washington State are still not paying attention. Austin Jenkins picked-up on the link between Kitzhaber and Inslee in a recent article for the Northwest News Network, but it’s not enough. Inslee is picking winners and losers, just as Kitzhaber was caught doing. Unfortunately, in our state, the winners are Inslee and the extreme environmental industry and the losers are hardworking Washington families. Inslee is a part of what has become an environmental political complex. Just like Kitzhaber, he is part of a system that runs on hypocrisy, corruption and selfishness wrapped in a veil of self-righteousness. This is the same circus, just different clowns. Ditto at the local level. Same circus, different clowns. We have all seen our local political environmental complex divert public resources to its own advantage. Surely this is corruption of the political process, but what about genuine scandal ... the kind of corruption that makes headlines, ends careers, and takes down politicians and career bureaucrats? That doesn't happen here, does it? Has there been any long-term misuse of funds, retaliation against whistleblowers, crony no-bid contracts, lame pretexts to try to get the sheriff's department to act as henchmen, or interference with the duties of an enforcement officer? That sort of thing doesn't happen here, does it? ... in one of the 50 places to see before you die? ... in one of the best coastal small towns? As County watchers may know, Sam Gibboney has the title of Director of Community Development & Planning (CD&P). She took over when Rene Beliveau retired. Gibboney, in turn, hired Linda Kuller to serve as Director of Long Range Planning. Kuller replaced Shireene Hale, who was shown the door after she spearheaded passage of the litigious CAOs. Among other things, Hale was ignominious for feigning fear of ordinary public meetings. In one email to our County Council prior to a public meeting, Hale accused both a former Planning Commissioner and a former County Commissioner of "intimidation" and of "stirring up fear, hatred, and hostility," and she added, "the possibility of violence should not be dismissed." Distraught with imaginary fear, Hale subsequently insisted that the now-defunct-sheriff Rob Nou stand guard over a public meeting involving her and the Council, without providing any prior notice to the Council itself. But back to Kuller ... Kuller came to us from Snohomish County. Before that, she was with Skagit County. Before that, she worked as a planner in Georgia. Note that we have other imported planners from Georgia also -- Colin Maycock came from there. We've gotten planners from Idaho too (Hale). Colorado (Biletnikoff). San Juan County must be heaven for planners because we attract them from all over. When in Snohomish County, Kuller "Wrote official code interpretations, rules, policies procedures, and press releases. Informed or managed special planning and policy projects such as comprehensive plan updates and seven year review, the NMFS/FEMA biological opinion, flood hazard area conditional letter of map revision, Endangered Species Act biological assessment, and planning grants." Grants ... of course ... grants had to be in there somewhere. Don't forget that Kuller used to be Linda Lyshall's housemate (Linda Lyshall of Conservation District fame). Lyshall was recently in the news because, barely had the thawing of relations with Cuba been announced, than Lyshall and the Conservation District were inviting Cuban communists to our islands to talk about Foundations for a Sustainable Future. Remember that our County Council voted to support the Conservation District with our tax dollars, so those aren't just any Cuban communists advising us on how to live, those are tax-sponsored Cuban communists advising us on how to live. On to Gibboney ... she (yes, "Sam" is a "she") transferred over from San Juan County Public Works, but before that, she lived and worked in Jefferson County. Gibboney has a degree in engineering, but she is not state licensed. In addition, she has no background or work experience in planning that would suggest qualifications to head Community Development & Planning. However, she is politically connected. 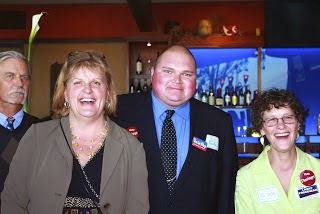 While in Jefferson County, Gibboney was campaign manager for Steve Tharinger. Steve Tharinger is a Democratic member of the Washington State House of Representatives. Press reports and records from Jefferson County describe Gibboney as an "environmental activist" who received "$500,000 in grant funding to the Watershed Stewardship and Research Center." The WSRC conducted "comprehensive site and ecosystem evaluations." In addition to doing work for the WSRC, Gibboney was the "Greater Seattle - Olympic Peninsula Conservation Director at Cascade Land Conservancy and President/Owner of ISE Consultants (environmental services). 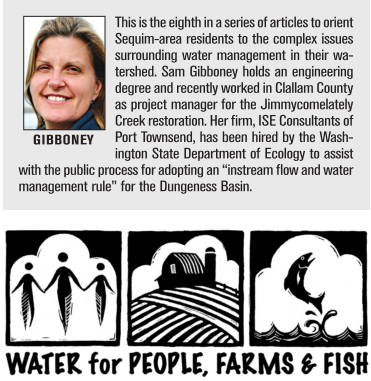 Gibboney's firm, ISE Consultants, was "hired by the State Department of Ecology to assist with the public process for adopting an instream flow and water management rule for the Dungeness Basin" in Jefferson County. That's right. We have a politically-connected environmental activist and former Ecology consultant as our CD&P Director. But wait ... there's more. While in Jefferson County, Gibboney also was President of the Port Townsend Food Coop when a dispute arose regarding a possible boycott of products from Israel. Gibboney came under fire from Coop membership for holding secret meetings to resolve the dispute. So ... correction ... we have a politically-connected environmental activist and former Ecology consultant as our CD&P Director who has a history of alleged secret meetings. Moreover, it doesn't look like Gibboney made a clean break with her private consulting work before joining San Juan County either. Based on at least one email, it looks like Gibboney used her San Juan County public email to finish up closeout work for WSRC and her company, ISE. Ms. Gibboney presented the Natural Resources Department Update, explaining the interrelation among the MRC (Marine Resources Committee), LIO (Local Integrating Organization) and LEAG (Lead Entity Advisory Group) and answered Council’s questions. She liaises, coordinates, and interrelates with the usual alphabet soup of time-wasting, grant-sucking bureaucrats. Nothing is different in CD&P, and arguably, they've gotten worse under this Council and County Manager, Mike Thomas. A few months ago, our Public Works Director, Frank Mulcahy, departed for greener shores. Mulcahy reportedly despised Mike Thomas. Mulcahy was a 20-year Navy veteran who had served in Iraq. He'd seen some pretty bad situations, but San Juan County was too much for him. Mulcahy even contemplated taking a job in Guantanamo Bay to get away from here. When planners and Cuban communists are coming to San Juan County, and 20-year military vets are thinking about going the other way ... you know things are worse than ever in San Juan County.